Throughout the centuries and in many cultures, traditional folklore medicine has made use of the burning of herbs for medicinal ceremonial and spiritual purposes. Ear pressure when flying or diving. But the list also includes- headaches, depression, a weak immune system, low energy, hyperactivity and attention deficit syndrome. HOW DOES THE EAR CANDLE ACHIEVE ALL THAT? With the ear candle inserted into the ear, the heat from the flame creates a stimulating, soothing, warming effect. The mechanics of this process are energetic in nature. Adding heat to the system, especially in such a subtle way, results in a stimulation of lymphatic drainage (swelling goes down). In stimulating the pituitary gland (controls glandular system). 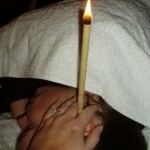 Ear candling strengthens the bodily systems through balancing the energetic system. The ear candling effect is the greatest when candles are used in succession. It is for this reason that ear candling practitioners who understand the process use, at the very least four candles per session. For serious health problems, candling sessions can be as close as 3or 4 sessions within the first ten days followed by another three sessions within 6 weeks. On a program like this great improvements in health are noted as a result of candling. One end of a cylinder or cone of waxed cloth is lit, and the other placed into the subject’s ear. Usually the subject is lying on one side with the treated ear uppermost and the candle vertical, perhaps stuck through a paper plate or aluminum pie tin to protect against any hot wax or ash falling down the side. However some have the subject sit up, keep the candle nearly horizontal, and watch for dripping wax. Some candles have an internal filter to catch debris. The flame is cut back occasionally with scissors and extinguished between two and four inches from the subject. Its proponents claim that the flame creates negative pressure, drawing wax and debris out of the ear canal, which appears as a dark residue. Using ear candles can safely be done by anybody at home after initially being instructed. For further information and training Active Health has an website, which, amongst other things, includes a lot of information about ear candling, and practitioner training courses are run on a regular basis. We also provide back-up for your questions and queries regarding ear candling. For more information about this therapy please feel free to telephone us for an informal chat.